Normal price in Cardiff Bay store. Which store did you find this please? What's the sell by date? Oh oh, I wouldn't drink it, I'd put it in an engine if I were you! A lot of castrol oil is only api sj spec pre 2001, looks like this is too. The latest is api-sn i believe. Ive no idea why its considered a premium oil. Its nearly obsolete. Hot Deal, ideal for those that bought the petrol mowers in the deals recently. 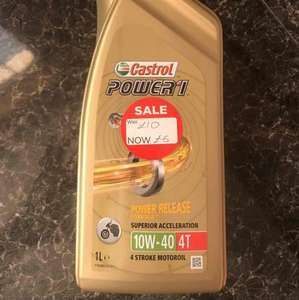 Ideal for those with 50cc-125cc bikes for a cheap oil change and those with 10w40 in their cars that just want a top up to keep in the boot.